Real Thai. Ready in 15 mins. Just add meat or veg. No MSG. No artificial colours, flavourings or preservatives.The ultimate street food and one of the world's most popular noodle dishes, Pad Thai has complex but balanced flavours. 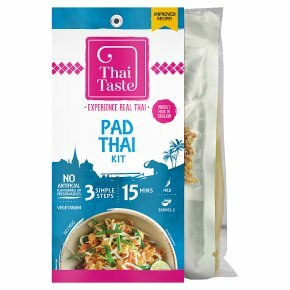 Our authentic Pad Thai Kit is made in Thailand with locally sourced ingredients, including tamarind, shallots, radish and fish sauce. Handy Tips Also delicious with diced chicken, fish, tofu, chopped vegetables, or whatever you have in the fridge! Add seasonal vegetables of your own choice. Try it with Thai Taste sriracha sauce, or chilli paste Not suitable for microwave cooking.